We’re getting more and more enquiries about interior design for hospices and hospice fit-outs, so we thought this would be a good opportunity to share some top hints and tips! These are things we’ve picked up along the way with our senior interior designer working on hospice fit-outs all over the country. So have a read and see if it helps you decide on your décor. Interior design for hospices can be a rather large project – particularly if it’s a complete new-build hospice fit-out. You want to make sure you have a consistent theme throughout the whole facility. A great way of maintaining your theme and hospice identity is by choosing a few accent colours (or prints) to feature throughout the building. It could be the signature colours of your hospice, or it could be a completely new palette. St Andrew’s Hospice in Airdrie opted to stick with their signature colours including purple, light blue, and a bright pink tone. Sticking to just a few accent colours is good because it gives you enough variety to make every room feel unique, but still a part of the whole hospice. Choosing small items to accent with colour like cushions, armchairs, and cushions can make all the difference. Having bright, vivid colours and patterns can also help make your hospice feel more welcoming and inviting to patients and their families. One thing to steer away from is having too many different patterns because they can easily clash with another. It can make a room feel too busy and even disorientating to some patients. Some patients will spend most of their time in their room, and ultimately, it is where many inpatients will spend their most vulnerable times. So you want it to feel as cosy and comforting as possible. Choosing the right pieces of furniture for each room can really help with this. Just because you’re creating a healthcare environment, it doesn’t mean everything you include has to look like it belongs in a hospital or a high-dependency unit. Adult palliative care facilities like hospices have a range of furniture and specialist equipment available to them now that doesn’t look like your stereotypical clinical hospital goods. You can have a care bed that you wouldn’t even know was a care bed, or you can have a hidden hoist that will give you the ability to transfer patients when you need to without even realising it was there. Accord Hospice in Paisley kept their bedrooms feeling cosy and comfortable thanks to some colour-coordinated furniture and an Integralift hidden hoist behind the bed. Lounges, dining areas, receptions, and even outpatient facilities will also need to be fitted out with a range of furniture. Choosing the right items can really help to make your hospice feel homely and supportive to patients, families, and friends. For lounges and dining areas, we always put forward a few different options for hospice fit-outs with various coffee tables, armchairs, and dining chairs. In doing this, it gives the client a chance to choose their favourites, but it always shows them how well different items of furniture can go together. For example, if you choose all the same armchairs, it might actually make the room look more clinical. There’s no variation and it ends up feeling as though the hospice décor wasn’t thought through. Combining different kinds of loose furniture but tying them together through colours and fabrics can really help make your hospice feel more united and it helps distinguish different areas of the room so patients can feel right at home. Infection control is a priority in most hospices, and we completely understand why. That being said, there’s no need to compromise hospice fit-outs for the sake of infection control. Any decent hospice equipment supplier or hospice fit-out specialist will be able to give you options to provide your equipment and furniture with special infection control options. Even down to the details of your chair fabric, we can help you maintain infection control standards without making your hospice look clinical or cold. We can even supply an infection control-friendly hoist system that minimises areas with dust and dirt can settle and harbour bacteria. 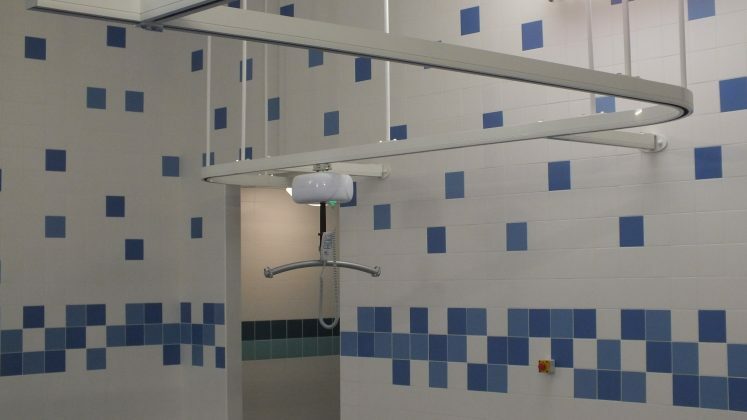 This hoist system can be supplied in a range of different colours and wood finishes to suit your hospice décor. Our Arene hospice riser recliner chair is available in an infection control model that has minimised fabrics and areas that can harbour bacteria. These four things are integral in interior design for hospices and hospice fit-outs. Making sure you tick all the right boxes can prove a huge difference in how your hospice turns out and how patients feel when they’re there. If you want some more help and advice on hospice fit-outs, contact our team to arrange an appointment with our interior designer.